Two Iowa State University botanists and their colleague at the University of North Carolina have discovered a new species of North American bamboo in the hills of Appalachia. It is the third known native species of the hardy grass. The other two were discovered more than 200 years ago. 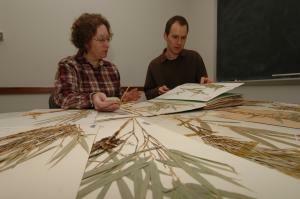 ISU botanists Lynn Clark and Jimmy Triplett study bamboo diversity and evolution. They first heard about "hill cane" from University of North Carolina botanist Alan Weakley. As soon as they saw it, they knew it was different. Lynn Clark, Iowa State professor of ecology, evolution and organismal biology, and Ph.D. student Jimmy Triplett study bamboo diversity and evolution. They first heard about "hill cane" from Alan Weakley, a botanist at the University of North Carolina. Although the plant was known to the people in the area, its distinctiveness was not recognized. Hill cane differs from the other two native North American bamboo species -- commonly known as switch cane and river cane -- in an important way: It drops its leaves in the fall. "That's why it was recognized locally as being different," Clark said. "It's pretty uncommon for bamboos to drop their leaves." Clark should know. She's an internationally recognized bamboo expert. She had previously discovered 74 new species of bamboo. "All the other new ones came from Central and South America," she said. "It's so exciting to find a new species in our own backyard!" Her 75th species discovery has been named Arundinaria appalachiana. Clark, Triplett and Weakley recently completed the intricate process botanists are obliged to follow to officially name and describe a newfound species. Following rules laid out in the International Code of Botanical Nomenclature, they prepared a short description of the plant in Latin and a longer one in English, and provided drawings and other information to make a strong case for the recognition of A. appalachiana as a distinct species of bamboo. They submitted their evidence in a manuscript to the scientific journal Sida, Contributions to Botany, convincing the peer reviewers that the bamboo they discovered was new. Their study was published last fall. There are 1,400 known species of bamboo. Of those, about 900 are tropical and 500 are temperate. The bamboos of North America are found in the Eastern and Southeastern United States, from New Jersey south to Florida and west to Texas. River cane (Arundinaria gigantea) occurs in low woods and along riverbanks. Switch cane (Arundinaria tecta) is found in non-alluvial swamps, moist pine barrens, live oak woods and along sandy margins of streams. "Most people have no idea that we have native bamboo in the U.S.," Clark said. "But it has been a very important plant ecologically. And there's recent interest in using it for re-vegetation projects because it's native and was used for habitat by so many different animals, especially birds." Clark and Triplett began looking at the North American bamboos as part of a larger collaboration with botanists worldwide to develop an evolutionary family tree of bamboo species. They're using modern DNA sequencing technologies together with traditional plant taxonomy, which involves observation and description of a plant's form, anatomy, ecology and other characteristics. "We want to get the big picture of how all the temperate bamboos are related to each other. That means taking inventory of what exists, then comparing notes," Clark said. They already know that the closest relatives of native North American bamboos are not in Central or South America, but are in East Asia. "That's a well-known pattern of diversity in plants and animals. Plants known to be closely related that were previously found across a large area of the earth are only in those two areas now. For various reasons, the Eastern U.S. and East Asia are a repository for a lot of diversity," Clark said. "But we still don't understand exactly how long it has been since our bamboos separated from their Asiatic cousins. And we don't know how we ended up with three species in North America and 500 in East Asia," she said. Although botanists had previously studied the North American bamboos, no one had done extensive fieldwork to study and collect the plants in the wild, and questions remained as to whether there was really more than just a single species. In 2003, with funding from the National Geographic Society, Clark and Triplett set off for the Southeast to find the switch cane and river cane in their native habitats. "Once we actually saw the plants in the field, we knew quickly that there were two distinct species," Clark said. "But we kept hearing about a third plant, called hill cane." And as soon as they saw it, they knew it was different. Note: This story has been adapted from a news release issued by Iowa State University.